One of the best things you can do for your child is to give them a healthy smile. (Ignore all of the tears for the first few years. They’ll thank you later.) 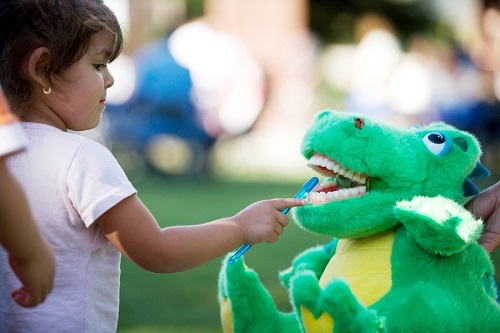 Teach your child how to brush and floss thoroughly, and they’ll benefit from these skills throughout their entire life. At StarSmilez, we want to help every child develop the habits and routine they need to keep their mouths healthy. Surprisingly, many of those who do brush their teeth twice a day, still suffer from tooth decay because they aren’t brushing thoroughly enough. As an educational tool, our StarSmilez characters serve as a demonstration model for teaching and practicing, as well as an encouragement to brush every day. Let them choose their very own StarSmilez character. 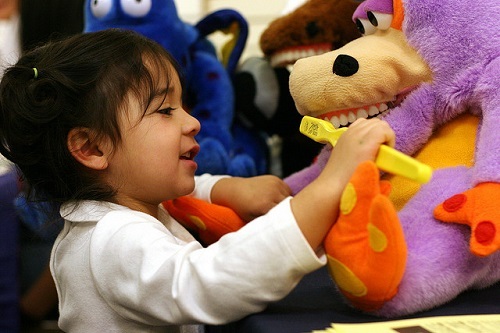 Introduce their character and explain how they both have to learn to take care of their teeth. Using the StarSmilez character, demonstrate how and where to brush. Let your child practice brushing on their new StarSmilez character. By watching them brush the StarSmilez character, you’ll get a better sense of how well they can brush their own teeth. As with most things, kids need constant reminders. Take time routinely to brush up on brushing skills with StarSmilez until you’re comfortable knowing that your child has mastered brushing skills. Need a helping hand at bedtime? Our Lil StarSmilez help teach and encourage kids to brush. Check them out!